FREE STYLE = NO INSTRUCTION. Use our printed step by step instructions to paint or work independently. Artist will be there to help you with supplies and color mixing, but NO STEP By STEP teaching will be available in this format class. 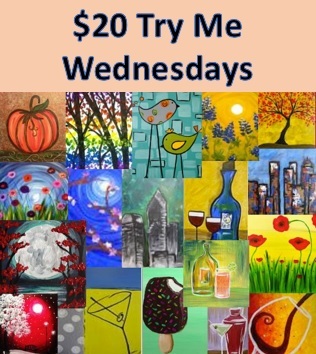 $20 try me Wednesdays; Paint as many as you'd like at $20 per each 8x8 canvas. Take as little as 20 mnts or as long as 2 hrs to complete your project. Artist available, but no formal instruction will be given. Freestyle Evenings are designed for people looking for some unstructured creative things to do individually or with friends and family. We have over 20 paintings with written "self-guided" instructions to help you create your personal masterpiece on a 8"x8" canvas. You can also use this time and our supplies to start or complete one of your own projects. If you have some prior art experience or just like to try new things, you are welcome to paint anything in our studio that catches your fancy but instructions are only provided for the designated 8"x8" paintings. $20 for each 8"x8" canvas. $25 for each 16x20 canvas.